Sample recommendation and reference letter to bank for confirmation of employment of your company staff for getting bank loan by the employee. This is to confirm that Mr. Santosh Kumar (Passport No.123 323232) has been working with us as a Procurement Officer since 25th October 2011. He is drawing a monthly salary of AED 12000/- inclusive of all benefits. During his tenure with us, we found him a hardworking, loyal and committed with his job responsibilities. This letter has been issued on his request and the management does not take responsibility for any of his liabilities with the bank loan at the moment or in future. Please do contact us on the below contact numbers if you need any clarification regarding this letter within 7 days of its issuance after which the company will not entertain any relevant queries. Sample application letter of recommendation for scholarship for your students. Some universities require recommendation letter from professor, lecturer, teacher to award scholarship on the basis of students performance in previous institution. Sir, I am Mr. George Best and I am a lecturer at McBurgh College, London. Our success is based on the hard work of our teachers as well as our students. Our institution is one of the leading institutions in UK and a huge number of your students come from our institution. However, there a student named Marshall Harris and He was one of the top students throughout his stay at our institution. He has scored good grades in all of the subjects. He was not only good in studies but also has a sharp mind and good ethics. I would like to suggest you to give him an opportunity at your prestigious university so that he would not only get a good degree but also will be polished to be able to succeed in his career. I hope you would consider this candidate. Thank you. It is to inform you that Mr. Rex Alex is currently enrolled in our BSCS program and he is in forth semester. He is a bright student and maintaining his CGPA. His current CGPA is 3.53 and according to the policy he is eligible for claiming the scholarship in order to continue his studies. The department has recommended his name to receive the scholarship for the academic year 2018-2019. Respectfully, it is stated that Mr. Albert is a student of A-levels 2nd group under roll No. 123-A-123. He is a bright student as well as a person with good character in my opinion. He never missed the class during the session. He always completes his credit hours. He respects the teachers and never involves in any discipline related inquiry. Being his Professor I am confident that he must highlight the name of his school in future. On account of all these characteristics it is my recommendation that Mr. Albert must be nominated for scholarship program for higher studies. Following is a scholarship recommendation letter which states that the student (Enter Students Name Here) has achieved a CGPA of 3.0 from the University Of Management and Sciences, and is considered applicable for any kind of scholarship he may apply either from the university or from HEC itself. This letter has been written in order to bring under your consideration that Mr. Mark James, former student of our college has graduated with 85% marks and he had shown good result through his studies. Keeping in eye his performance I would recommend him for Master’s program from your prestigious institute. I have that he will show consistency and will attain high marks. Sample letter to say thanks for for recommending you for job, promotion, admission, salary increase etc. Dear Uncle, I am delighted to tell you that I have been selected at E&Y as an Auditor and all credit goes to you. 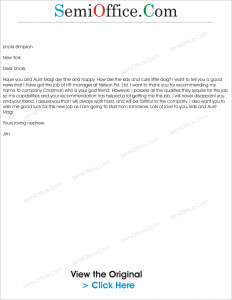 It was because of your letter of recommendation that I got selected in one of the biggest firms of the World. They have asked me to join from coming Monday and I am simply over the moon because this is the turning point of my career. I have told my parents about it and they are very thankful of you. Do visit me so I could thank you by having you and your family over for dinner. May God Almighty grant you success and happiness with every step you take. Hope you and Aunt Magi are fine and happy. How are the kids and cute little dog? I want to tell you a good news that I have got the job of HR manager at Nelson Pvt. Ltd. I want to thank you for recommending my name to company Chairman who is your god friend. However, I possess all the qualities they require for this job, so my capabilities and your recommendation has helped a lot getting me this job. I will never disappoint you and your friend. I assure you that I will always work hard, and will be faithful to the company. I also want you to wish me good luck for this new job as I am going to start from tomorrow. Lots of love to you, kids and Aunt Magi. Thanks for your recommendation for promotion. I had been promoted to senior manager last week. My monthly salary has also been increased with increase in all other perquisites. This all have been only due to your recommendation for promotion. I would always be thankful for your consideration. I assure that I would pay more attention to the work and would not let you down. 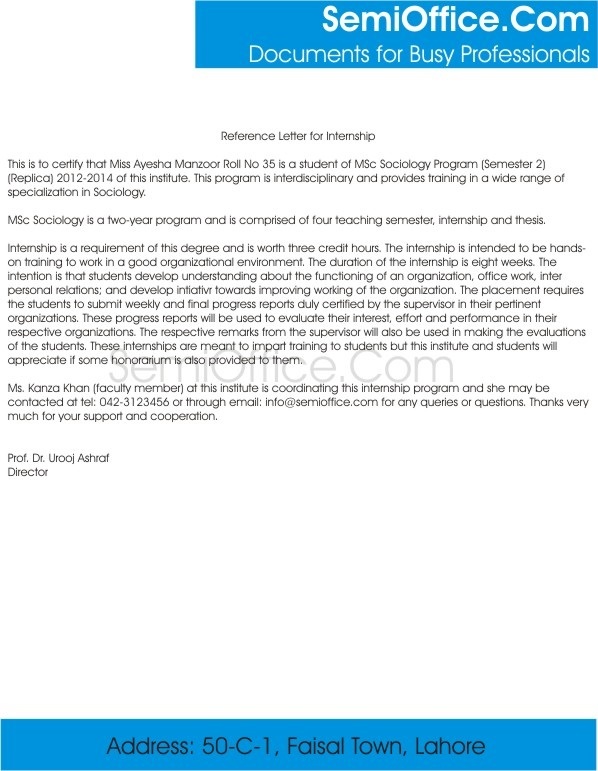 Reference Letter for Internship Program for students of School, College or University. Sample recommendation letter for internship student from professor, college or university for employer or the company where you want to work as internee. It is certified that Mr. Alan is a student of aviation technology at Balkent University with excellent academic record under registration no. XX201504. This letter is to recommend him for the summer internship at your esteemed organization so that he may learn the aviation operations, research methodologies and work flows. Kindly enroll him in your summer internship program. (Replica) 2016-2017 of this institute. This program is interdisciplinary and provides training in a wide range of specialization in Sociology. MSc Sociology is a two-year program and is comprised of four teaching semester, internship and thesis. Internship is a requirement of this degree and is worth three credit hours. The internship is intended to be hands-on training to work in a good organizational environment. The duration of the internship is eight weeks. The intention is that students develop understanding about the functioning of an organization, office work, inter personal relations; and develop initiative towards improving working of the organization. The placement requires the students to submit weekly and final progress reports duly certified by the supervisor in their pertinent organizations. These progress reports will be used to evaluate their interest, effort and performance in their respective organizations. The respective remarks from the supervisor will also be used in making the evaluations of the students. These internships are meant to impart training to students but this institute and students will appreciate if some honorarium is also provided to them. Ms. Kanza Khan (faculty member) at this institute is coordinating this internship program and she may be contacted at tel: 042-3123456 or through email: info@semioffice.com for any queries or questions. Thanks very much for your support and cooperation. The College of Home Economics(CHE) post graduate program requires our students to complete a mandatory 4 weeks internship during the month of summer break.The College of Home Economics prepares its students in various areas such as Food & Nutrition, Textiles & Clothing, Human Development and Family studies, Housing, Home Management and Interior Design, Arts and Design, Education and Research. Our girls are trained in the areas of dietetics institutional Managements, Textile manufacturing fashion designing and apparel construction, interior designing creative art and crafts, teaching, conducting research, report writing and community work to name a few. We appreciate that your organization/institution offers a professional work environment and the experience gained by the interns will be valuable to developing their skills. Your are requested to permit them for conducting the internship. Your kind act will be highly appreciated. 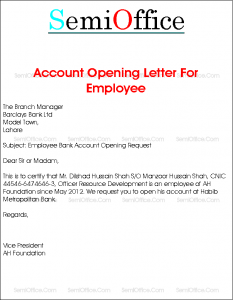 Sample application letter to bank manager for opening of bank account of your company employees, managers, executives and teachers. Sometime banks ask for this letter from employer or company to open basic bank account or salary based bank account. New Employee reference letter for bank account opening from the company. My name is Charlie and I am in charge of the audit and salary of the Matt and Murdock Legal Services. I am writing this letter to request for opening a new account for our new employee. As this is the policy of our firm that the salaries are transferred only to the account that is opened by the company itself, so I request you to open an account for our new employee. The details of the account are given below. I hope this information will be enough for opening an account. If you need any other information do let me know. I hope you will do this in 1-2 working days. You are requested to open a salary account for Mr. Zia Hassan S/O Hassan Mehmood. He has been employed as the regional sales manager w.e.f. 15th July, at our firm, RC Cola Private Limited. His per month salary is thirty five thousand Rupees only. Please find a photocopy of the required documents, photographs and the filled application form attached with this request letter. Kindly open a salary bank account to this employee with online bank facilities and ATM services as soon as possible. It is submitted that I am a govt employee and have recently been posted to this city. It pertinent to mention that I am account holder of your bank for the last 15 years and that I am fully satisfied from the services being provided by your bank and want to keep enjoying the same in this city also. It is therefore requested that a bank account may please be opened in my name in your branch so that I can withdraw my salary from the same. An attested copy of my identity card along with posting certificate duly signed and stamped by my office seal is attached herewith. Your cooperation in this regard will be highly appreciated. It is certified that Mr. Ahmed , is employee of Marvel Sons as a Project Manager having salary of Rs. 25,000/- P.M. and he wants to open a new account in your bank with online banking facilities. Please entertain his request and facilitate him for the opening of new bank account and oblige. Thank you very much for your best banking services for our school. On behalf of our school director I request you to please open basic banking account or Salary account on behalf of our school for newly hired teacher Ms. Sumbal in our school. Ms Sumbal will visit your branch with this letter and all other required documents for the account opening will be provided. This is to certify that Mr. Dilshad Hussain Shah S/O Manzoor Hussain Shah, CNIC ————-, Officer Resource Development is an employee of AH Foundation since May 20——. We request you to open his bank account at Habib Metropolitan Bank. Thank you very much for excellent services from your bank for our company and employees. Recently we hired new staff for our company and I am writing to request you to please open their bank accounts in your esteemed bank as per our contract for salary and payment transfers. Details of the staff members with copies of CNIC are enclosed. All the staff members and company will be at your complete disposal for any information or document that you may require. Through this letter I express my gratitude towards your valuable banking services for our company and employees. I hope that our affiliation continues and we will have more cooperation in the future. Our company hired some new staff members recently and I am writing on behalf of our company for their account openings in your prestigious bank. 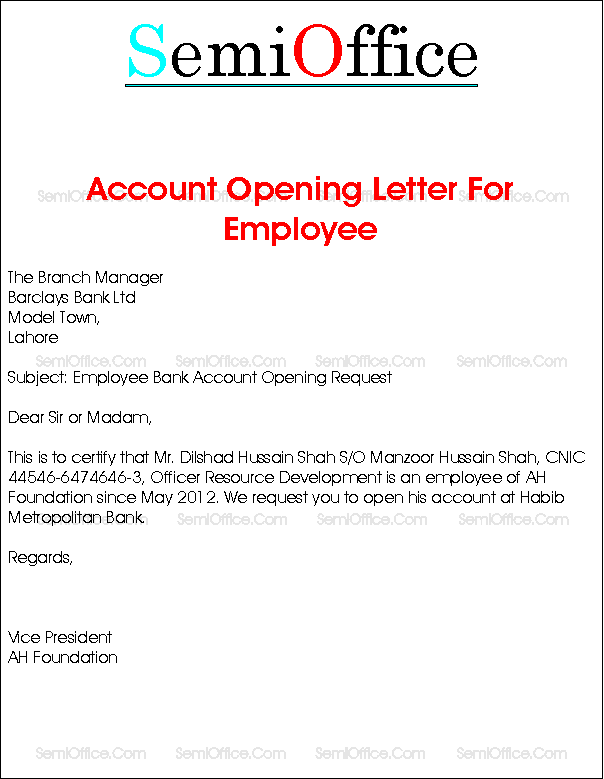 Employees details including their NIC and duly filled bank account opening form is enclosed with this letter. Looking for your cooperation. In this account bank offer minimum charges and limited transactions. Many companies use payroll system integrated with banks for monthly salary transfers so these companies required their employees to open bank account in the same bank where payroll system is integrated. This is to confirm that Mr. Habeeb Rehman, Passport No.___________ ____has been working with us since_______________ as a _________________. His monthly salary is PKR 450000/- inclusive all the benefits. Please help him to open a saving account with your bank at the earliest. This letter is being issued at the employee’s request and the company takes no responsibility of his any kind of liabilities with the bank.